I have a confession. I’m guilt of the “I’m Sorry…” column way too much. I’m sorry I am. 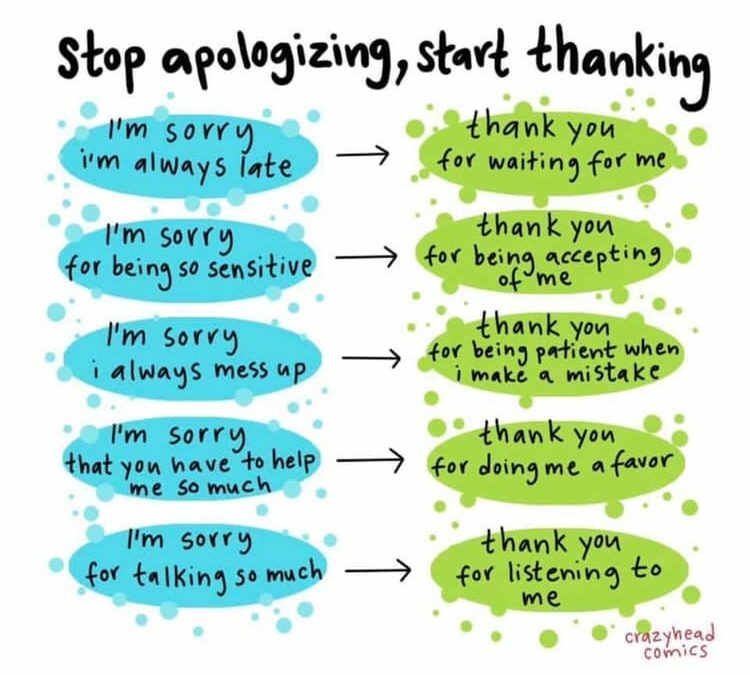 I find myself often apologizing for talking too much all the time. What am I really saying when I do that? I’m saying, “Really, what God has put in my heart isn’t worth listening too, I’m really stupid, don’t listen to me when I talk…” I’m slamming the gift God has put in me. I’m slamming and apologizing for who God made me to be. I’m being ashamed of who I am. I’m so sorry I do that. I want to start thanking more. I’m trying to change, and be thankful for the gift within me, and rejoice in who I am in Jesus. I don’t have to apologize for being me. I’ve done this for way too long, it’s become a life long habit. I’m slowly turning the rudder of this ship of constantly apologizing, to being thankful for who I am, and what God has put in me to share with others. For years I believed the lie that I was stupid, and everything I had to say was stupid. Thus the habit began of always apologizing for every word that came out of my mouth. I’ve come to know now, through the help of God’s Word, what a lie that is. The Jesus in me does have something to say, and even though it has to come through the filter of ‘Kelley’ that’s ok, cause he made me too.